Called Blue Eye, this underwater passenger lounge will be located within the hull beneath the water line, and will allow the ships guests to view and hear the underwater world surrounding the ship. The design of this technically challenging room was entrusted to architect Jacques Rougerie, who is deeply passionate about the sea. Rougerie’s mission is to enable PONANT guests to perceive and feel the underwater universe that has never ceased to amaze and inspire him throughout his career. The state-of-the-art technology developed with PONANT lets guests become modern-day explorers, following in the wake of Jules Verne, Jacques-Yves Cousteau and the great adventurers. They will be able to observe the fauna and flora of this sub-aquatic universe and discover its sonorities. The sound system in the Blue Eye lounge will be installed by Michel Redolfi so as to reveal to the guests the amazing listening capabilities of their bodies. For the first time in the world, the public, during a cruise, will be able to ‘feel’ and be at the heart of an underwater world. They will need to use all of their senses. 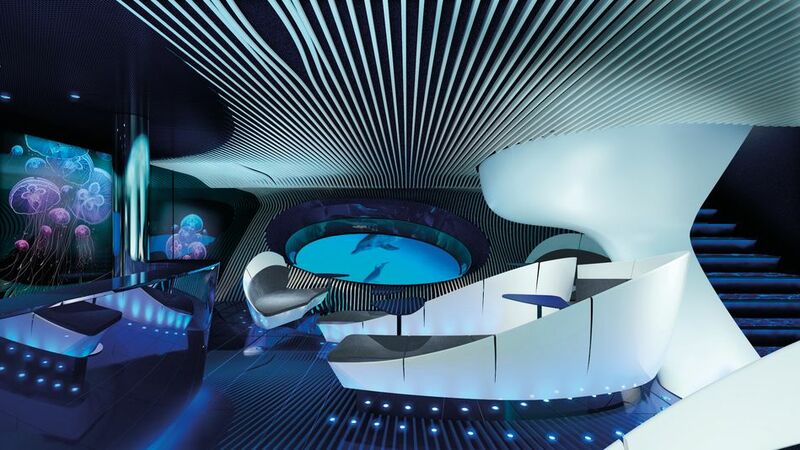 Jacques Rougerie drew inspiration from his observation of nature in order to determine the key elements that would underpin the design of the underwater lounge. The space’s graphical references evoke cetaceans and jellyfish. This inspiration is evident in the lines of the lounge, the positioning of the body, the furniture and the fittings. All focus is drawn towards the two portholes, shaped like the eye of a cetacean and looking out upon the subaquatic world. The mural décor disappears to make way for the integrated digital screens projecting the images filmed live by three underwater cameras. Placed at the ship’s strategic points, these cameras enable guests to witness, for example, the spectacle of dolphins playing in the bow waves. The sound staging has been entrusted to Michel Redolfi, a contemporary music composer and sound design expert. 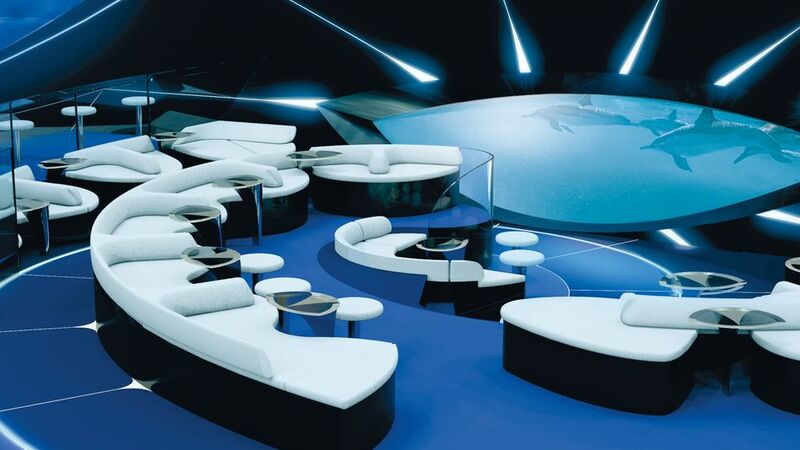 A result of his research into subaquatic music and his own inventions, the sound design of the underwater lounge develops state-of-the-art technology and offers guests an experience in acoustic immersion that is unique in the world. Guests can listen to the underwater world thanks to hydrophones that are integrated beneath the keel. The natural symphony of the deep sea is thus captured across a five-kilometre radius and transmitted live into the lounge in the form of acoustic waves spreading through the three dimensions of Jacques Rougerie’s architecture. An immersive sound experience can be felt in the Body Listening sofas, which discreetly vibrate in unison while offering unique sensory listening through corporal resonance. This global listening through the entire body, in harmony with the ocean’s natural cycles, will bring guests closer to the marine mammals they might see and hear behind the giant portholes. This exclusive sound experience is also offered through subaquatic concerts broadcast at sea or in the swimming pool. PONANT, the polar expedition leader and pioneer, is expanding its unique luxury expedition cruise concept with the arrival of four new sisterships, the PONANT EXPLORERS. PONANT guests will be able to enjoy new travel experiences, such as tropical and subtropical expeditions. Offering a unique blend of discovery and exceptional comfort, even in the most remote corners of the world, is our hallmark. In keeping with the cruise line’s philosophy, each ship combines a limited guest capacity, sleek design, cutting-edge technology, and respect for the environment.